Who would want to take on the task of putting together a full-length recitation of “Finnegans Wake,” the comic novel by James Joyce? It’s famously considered a “difficult” book, written in a stream of consciousness style, a book whose “meaning” has been debated about since its publication in 1939. It’s a project Waywords and Meansigns has been working on since 2015. That’s the year the first edition came out, followed by a second edition 2016, with different musicians contributing to each edition. Now comes the third edition — and this time you’re invited to contribute as well. Unlike the first two editions, which were unabridged, this version is incomplete (more on that in a moment). But at 124 tracks, it’s still massive, so let’s just take a look at the contributions by the four Northwest acts: The Science of Deduction, Kinski, Old Fiends, and Neal Kosaly-Meyer. The synth-based Science of Deduction have a decided literary bent themselves, with a name taken from Sherlock Holmes’ modus operandi, and songs like “The Modern Prometheus” (inspired by “Frankenstein”), and, of course, “James Joyce is Going Blind.” The synths provide a nice cushion for Cathy Sorbo’s crystal clear voice, as she makes her way through a section of Part 2, Chapter 3; it’s the most rhythmic delivery . 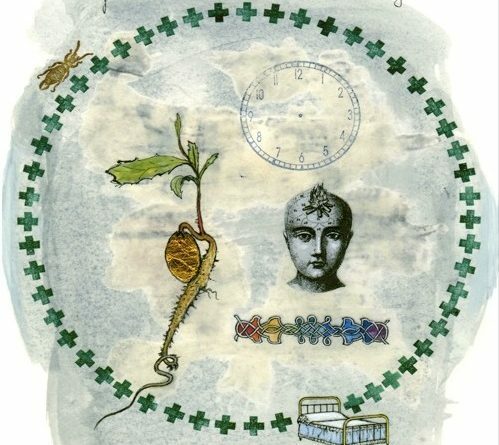 Kinski (Part 2, Chapter 3) chooses a more organic approach; there’s an electric guitar, but also the sounds of a flute and piano, backing the warm, calm voice of Morna Reid-Schwartz; the bedtime story version. Old Fiends (Part 1, Chapter 6) consists of members of Mercury Rev, Whip, and Favourite Sons, and they’ve produced a decidedly ominous version. It starts with eerie wailing and clattering, then quickly cutting to a stark piano pounding away (with occasional interludes). The male voice reading the piece has a nice Irish lilt, the kind you might hear at a pub as you’re sipping on Guinness; the poetry reading version. Kosaly-Meyer (Part 1, Chapter 3) chooses to present an a capella version, sans any kind of musical backing. It’s a bit of a gamble, as the focus is completely on the words, and if you don’t have the voice, it’s not going to work. But Kosaly-Meyer does; his wonderfully rich intonations hold your attention throughout. Some of the other contributors include Mike Watt, Little Sparta with Sally Timms (Mekons), and Martyn Bates (Eyeless in Gaza), among many others; over 100, from 15 different countries. The work is available on the Waywords and Meansigns website, for free. It’s described as an “open edition,” meaning you’re invited to submit your own recording for future editions (there’s even an open score you can download if you’d like to use that as your backing). The varied mix makes it quite entertaining to listen to (you can even hit “shuffle” and create your own mix without compromising the narrative). 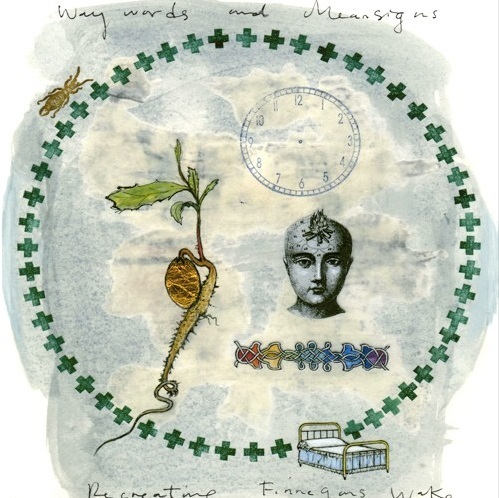 “Our goals are simple,” states the website, “to have fun with James Joyce’s ‘Finnegans Wake’; to make the book more accessible to newcomers; and to create a version of the text that appeals to dedicated listeners, students, scholars and Wake-obsessed people everywhere.” It’s an eclectic experiment, and you can choose to join in the fun, or simply sit back and enjoy.